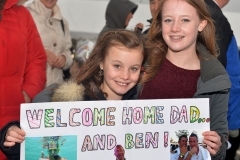 Sailors from the Royal Navy warship HMS Argyll returned home to Plymouth Naval Base to a cheering crowd of families and friends after a successful six-month deployment to the Caribbean and North Atlantic seizing illegal drugs and giving out disaster relief. 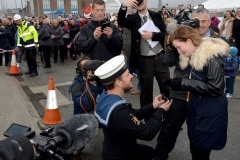 The celebratory atmosphere was heightened by a surprise marriage proposal on the jetty by a sailor to his girlfriend of six years and by the reunion of a father from the ship with his baby born during the ship’s deployment. 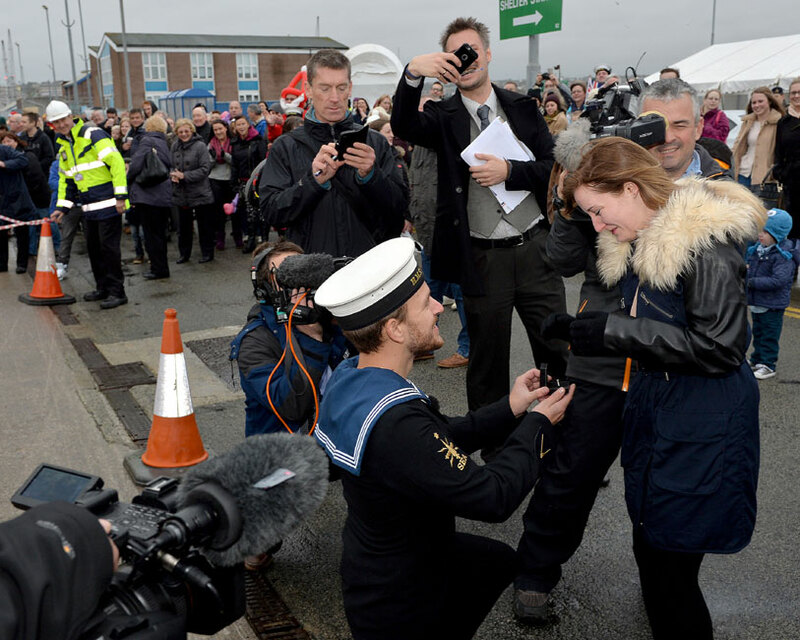 Nervous Able Seaman Ashley Jakes, 25, from Plymouth, knelt on one knee in front of the crowd and asked Amanda Barlow, 24, to marry him. Amid cheers from the crowd Amanda, a Royal Mail worker, happily accepted and proudly showed off the ring he placed on her hand. He has been working on the proposal for two months and bought the ring in the US where the ship made a diplomatic visit. 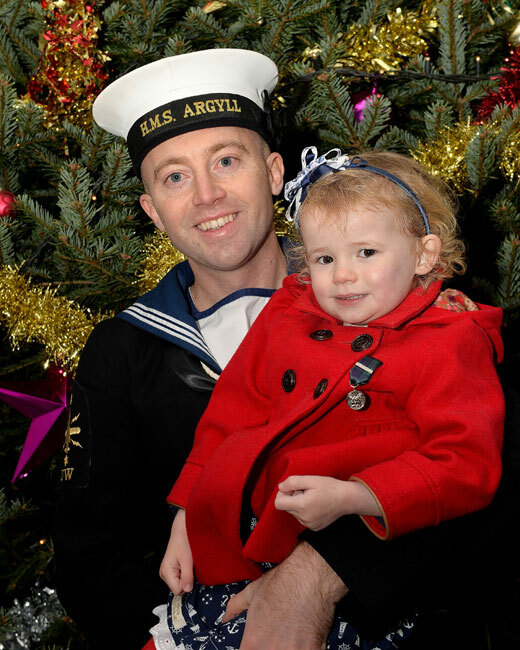 Another special Christmas present was awaiting Technician Kris Lindsay, from Edinburgh, on the jetty when he rushed off the ship to be welcomed by his partner Laura Allan with their baby Kayden Lindsay who was born while the ship was deployed in August. 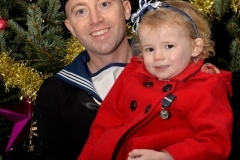 Kris said: “It’s really good to see Kayden and Laura again after months away from home, especially at Christmas when we should all be together. HMS Argyll’s deployment included four separate successful drugs busts and a high-speed dash to give humanitarian aid to hurricane hit Bermuda. The drugs seizures included a stop-and-search of a yacht, a high-octane night time chase and a precision sniper-shoot of a speeding drug running boat’s engines. Overall, the ship directly seized over 1,800 kg of cocaine with an estimated wholesale value of £77 million. 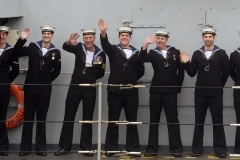 HMS Argyll has travelled over 25,000 nautical miles during her deployment visiting 16 countries in representing her UK across seven time zones. She has spent 183 days away and experienced all types of weather, from calm seas to the aftermath of a hurricane. 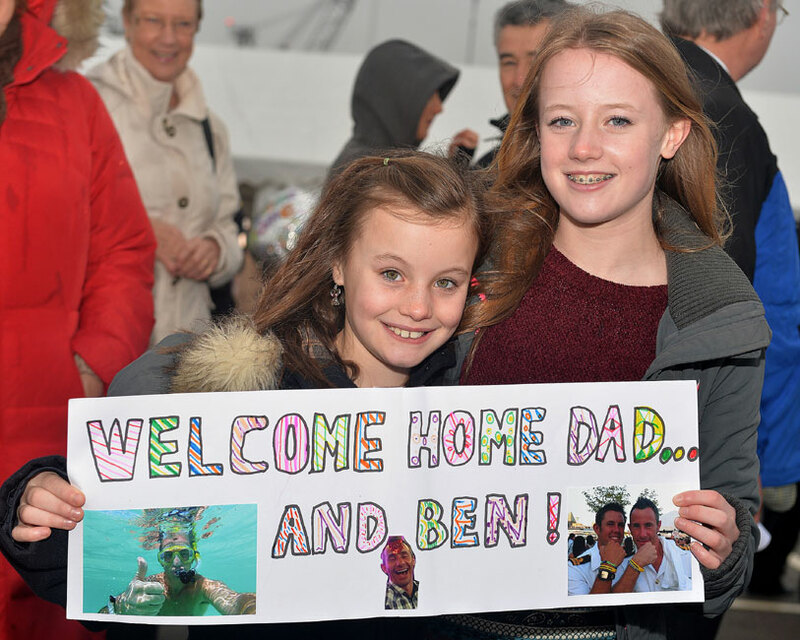 Following her departure in June, HMS Argyll’s initial task was one of reassurance as she travelled between the UK Overseas Territories in the North Atlantic and Caribbean. Visits focussed on engagement and discussion of humanitarian and disaster relief operations and all of the territories from the largest, Bermuda, to the smallest, Montserrat, gave the ship and her crew a very warm welcome. HMS Argyll’s most high profile defence engagement visit was to Baltimore in the US for the 200th anniversary of the American National Anthem. An international flotilla was assembled including German, Turkish, Norwegian, Canadian and US ships. 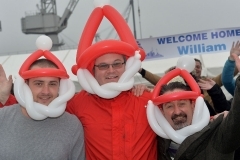 HMS Argyll hosted 11,000 members of the public. 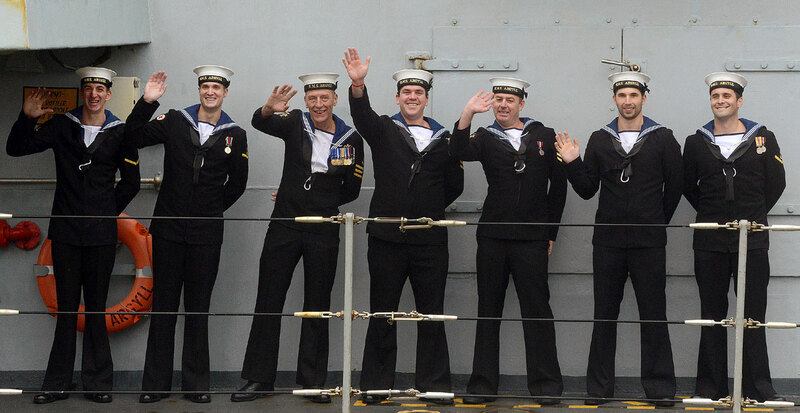 After these celebrations HMS Argyll sailed south to Belize, Mexico and the Cayman Islands. On sailing from Grand Cayman the ship received a request from the Bermudan government to help the island recover from Hurricane Gonzalo’s destructive 100mph winds. The crew provided a range of assistance to the UK territory including aerial reconnaissance, engineering support, specialist teams for working at height and a surge of manpower to clear vital transport lins. In Cartagena, Colombia HMS Argyll hosted an official reception onboard for HRH the Prince of Wales and HRH the Duchess of Cornwall as part of their tour. 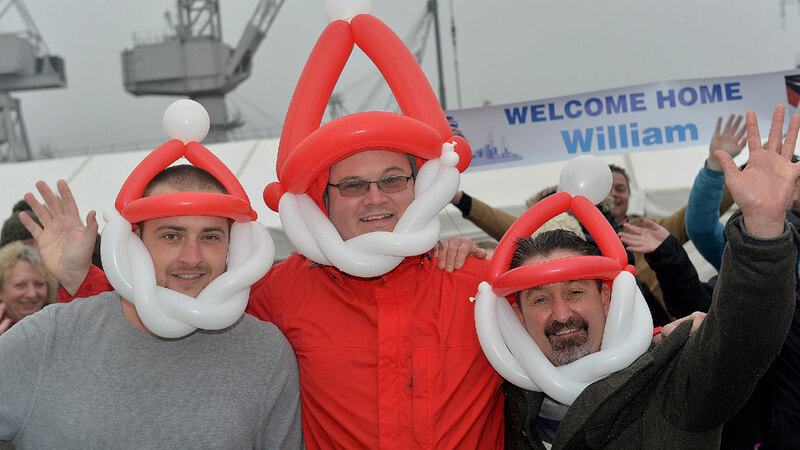 The ship also went to the Dominican Republic and to Havana, Cuba to build on the UK’s mutual relationship. 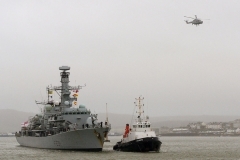 Despite the intensely busy patrol, HMS Argyll’s crew also took time to raise £6,000 the Royal Navy and Royal Marine Charity, the Devon and Cornwall Air ambulance and Bristol Royal Children’s hospital. Sailors also donated to a collection for the construction of a school in Nepal. The ship also marked WWI with remembrance events at many port visits. The crew’s football and rugby teams played 11 games throughout the Caribbean region and took part in basketball, golf and white water rafting. 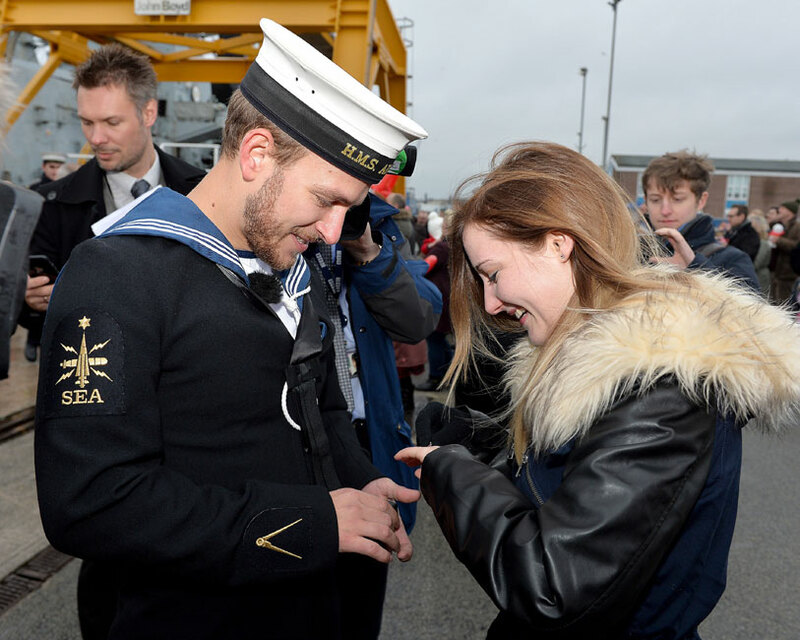 HMS Argyll’s Atlantic patrol duties were handed over to HMS Severn and the ship will now begin well-earned leave and maintenance in Devonport prior to UK tasking next year.